I became a MCCF board member because I see the transformational work the MCCF accomplishes and knew some of the important community leaders that had served before me. Leaders such as Richard Ford, John Zeglis, Carolyn Kline and Barbara Winters. The privilege of working with them or following in their footsteps has been an honor. I strive to do justice to them. I serve on the MCCF grants committee where I see how unrestricted funds are used to support causes in the community. Through this I’ve learned about many of the good people and organizations throughout our county that make a difference. I’ve been able to support fledgling groups like the Culver Community High School Archery Club and Culver Main Street get off the ground, and helped the Culver Boys and Girls Club and the Lake Maxinkuckee Environmental Council expand their mission. Do you love the West Pavilion on Lake Maxinkuckee? A MCCF grant helped restore that Culver treasure! I also serve on the MCCF investment committee where I see the time, effort and careful consideration that goes into marshaling the Foundation’s funds to do the most good while keeping an eye on the conservation of their value. I became a MCCF contributor for various reasons. I have given to the unrestricted fund to help support those groups that come before the grants committee. I have donated to dedicated funds that support causes with missions I believe in, such as Hospice and Habitat for Humanity. And finally, I have contributed to remember and honor friends. I served on the Culver Chamber of Commerce board of directors for over a decade and lost two friends who were fellow board members during that time. For that reason I have contributed to honor the memory of those friends, Ron Tusing and Marianne Ransdell, both of which have memorial funds that give scholarships to CCHS students. For those of you familiar with Marshall County Community Foundation, you’ll see Marshall County Match Madness as an opportunity to make your charitable donation go further. For those of you unfamiliar with the Foundation, get to know them! 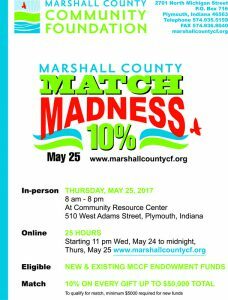 On Thursday, May 25, make sure to donate at: www.marshallcountycf.org and 10% will be added to your gift. Or, you can go to the Community Resource Center at 510 West Adams Street, Plymouth, and talk to nonprofits and MCCF staff and ask any questions you may have. 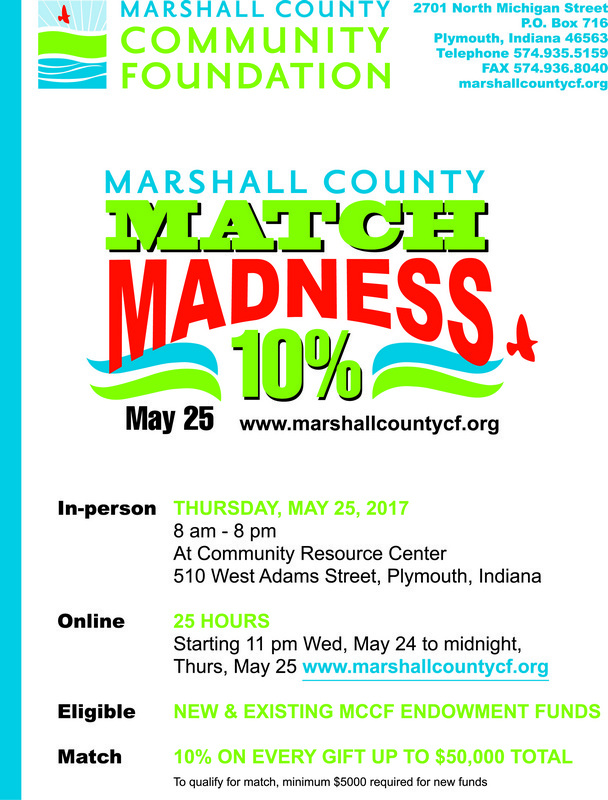 Remember, Marshall County Match Madness is on May 25. Let’s make this a stellar day for Culver!